A broad bean salad can be adapted, depending on your taste, to include many different ingredients. The season when fresh broad beans can be bought is relatively short, but tinned broad beans are an acceptable alternative when making this salad out of season. 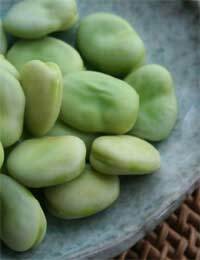 It is important to bear in mind that when you purchase broad beans in their pods that they will be considerably reduced in weight once you have removed their pods. 1/2 a tablespoon of basil and parsley and some salt and pepper. some black pepper and a teaspoon of salt. Fifteen minutes before you plan to start cooking your broad bean and pancetta salad, light your grill and place it on its highest setting. Once the necessary time has elapsed, and you have placed your pancetta on some tin foil, place it under the grill for approximately 5 minutes, until it is crisp. Once crisp, remove your pancetta from under the grill and leave to cool. When the pancetta has cooled sufficiently use your hand to crumble it into small pieces. Next take the shelled broad beans and put them in a saucepan, adding half a teaspoon of salt. Then cover the shelled broad beans with boiling water before boiling and simmering for four minutes. The dressing to go with your broad bean salad can be made by crushing the salt and garlic into a creamy paste, before blending in the mustard powder, pepper and vinegar. Finally add the olive oil to the mix. Once cooked, drain the broad beans and add to the dressing, before adding the herbs, pancetta and shallots. Next leave the broad bean salad to rest for at least 2 1/2 hours before eating. It is possible to use asparagus and poached eggs to help jazz up your broad bean salad into something out of the ordinary. Remove the broad beans from their shells and trim your asparagus making sure the woody end has been removed. Next wash the watercress and radish, removing the stalks and roots from the latter. Place the asparagus and broad beans in a pan, that has approximately 2 inches of water in it, and cook until they are tender. This should only take approximately 7 minutes. Next slice the radishes and chop the watercress before blending with the ingredients for the dressing. The dressing ingredients will be covered later. Then place the beans and asparagus on a plate and pour the dressing. The eggs can be poached or hard boiled. If you choose the poached option it should take approximately 4 minutes to poach an egg. Once complete, place an egg atop each salad. 1/4 tea spoon of honey.